We are not canine nutrionists, so our advice/info is based on our own feeding of our dogs and of others plus information sourced from internet. If you have dietary issues we advise seeking advice from a canine nutrionalist. When you bring your puppy home, the breeder will have normally given you some of the food your puppy has been weaned onto. As the puppy grows or through personal preference you might find that you wish to change the food they are on. If they are on a kibble diet it is best to introduce any new kibble slowly over a course of about 7-14 days. Start by detracting about 10% of the old food and add in 10% of the new and gradual increase the amounts over the 7-14 days until your puppy is completely on its new food. If you rush or change over straightaway it can result in upsetting their digestive system and give them upset tummies. Puppies are normally fed 3-4 meals initially , gradually reducing to two meals at approx 6 months. Normally the lunch time meal is stopped. As adults you can feed one or two meals to your preference. Switching from puppy kibble to adult, depends on the manufacturers guidelines, so see back of packet, or contact your supplier. Usually they switch around a year old onto adults but some dogs may want to go on earlier. Look for food that contains a good % of protein as some may only contain a low 4% or the protein only comes from animal derivatives. Don't be put off by price as high quality food usually means less quantity. Work out the cost of the meal.So for example a 15kg bag of food costs £40. So first work out what 1kg costs. So 40 ( the cost of the bag of food) divided by 15 ( the weight of the bag) = 2.66. so 1kg costs £2.66. Then work out what 100g costs so 2.66 divided by 10= 0.266p so rounded up would be 27p.Then see how much in grams the dog needs to be fed a day so say dog needs 200g per day then the cost would be 2x 27p=54p. Working out the cost per day helps you budget and you can see that sometimes the more expensive food works out not much more expensive than the cheaper brands. Always ensure that there is a fresh bowl of drinking water available at all times when feeding kibble. Some dogs prefer to be fed wet food ( meat) which comes in tins, trays and pouches . You can add some fun into feeding times by filling a kong with some food or some even throw their food out over the grass on the garden and make them look for it. When making a decision on what commercial food to buy it can be a minefield trying to understand the labels and what it means. We recommend looking for foods that contain a good content of protein. Some foods may contain soya which is harder for dogs to digest and are a cheaper alternative to use. Try to avoid food that contains animal and or/vegetable derivatives and that are not bulked out with fillers. Animal derivative is a generic term for animal proteins that can come from any part of the animal and is the cheapest form and you will never know for sure exactly what it is. Vegetable derivatives again are a cheap way to bulk out food and you will not know for sure what it is, it could be for example vegetable residues. Fillers are usually things like cereals but the cheaper end and provide little nutritional benefits and can some dogs do have allergies such as wheat allergy so grain based foods are one in this instance to be mindful of and often ones to eliminate if you cockapoo starts licking paws, scratching or getting constant ear infections. What needs to be on the label? Whether the product is complete or complementary. The species for which the product is intended. % of ash in the product (ash represents the mineral content of the food and is determined chemically by the burning of the product). Ingredients must be listed in descending order of weight and if preservatives, antioxidants and chemicals are used they must be shown using their category or chemical names. Vitamins also must be shown and their levels. This level includes whether naturally present in the raw materials and/or added. Meat: Meat is the clean flesh of slaughtered animals (chicken, fish, lamb, turkey, etc.). Meat By-products: Meat by-products are clean parts of slaughtered animals, not including meat. These include lungs, kidneys, brain, liver, blood, bone, some fatty tissue, and stomach and intestines freed of their contents. It does not include hair, horns, teeth, or hooves. Animal Derivatives: Is a generic term and can include anything related to an animals so could include, heads, beaks, feathers , hair, etc. Meal: (as long as they are from a specified type of animal, such as chicken meal, lamb meal, salmon meal etc.) are not inferior to whole, fresh meats. Meals consist of meat and skin, with or without the bones, but exclusive of feathers/hair, heads, feet, horns, entrails etc. and have the proper calcium/phosphorus ratio required for a balanced diet. They have had most of the moisture removed, but meats in their original, "wet" form still contain up to 75% water. BHA: BHA is butylated hydroxyanisole, an artificial fat preservative. Ethoxyquin: Ethoxyquin is a chemical preservative that is used to prevent spoilage in dog food. It is artificial. Animal Fat: Fat is important to dogs health but better sourced from vegetable means. Animal fat is cheap and palatable. Named animal fats are better but vegetable fats are the ones to preferably have. SunflowerOil/Linoleic Acid: good source of Omega 6. Information above sourced from the internet, we cannot confirm the accuracy of information, you may need to conduct your own research. A lot of people like to feed their dogs RAW or a BARF diet (Bones and Raw Food). Some include vegetables and fruit whilst others just meat and bones. The amount to feed for adults is normally around 2-3% of their weight. 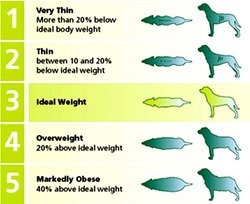 Start off with 2% and increase if necessary, very active dogs may need more, go by how your dog looks and feels ( see body shape chart further down page). For puppies feed 3% of expected adult weight, if unsure here is an approx guide : 2-4 months 8-10%, 4-6 months 6-8%, 6-8 months 4-6%, 8-12 months 3-4%. Bones are excellent as they clean the teeth but avoid the weight bearing bones such as leg bones of cows and lambs as they are too dense and they can chip the enamel of a dog's teeth. A rule of thumb is that if you can stick a knife in the bone, then it is usually soft enough to feed (think pork/lamb rib bones, chicken/duck/rabbit bones). The ratio used for raw feeding is 80:10:10 this is 80% protein/muscle meat, 10% bones and 10% offal. Though some dogs may need slighter more bone. This is a guide so is not rigid. Go by how you dog looks, his weight and his poos! If poos are too hard and rigid and dog is struggling to poo or poos are crumbly and chalky then decrease the amount of bone this can be done by having a couple of days free from bones so feed meats only/fish/tripe etc... if poos are too soft then increase the bones slightly. It is recommended that the offal includes 5% liver and the rest is other offal .Do not over feed liver as it contains vitamin A and too much is not good, and also can cause bum explosions!!! Ideally start with one protein source like chicken and if dog copes well with that then you can add more variety gradually. We recommend that you don't rush and take your time introducing new foods. If your dog has a problem i.e. being sick go back a step to what you are using and then try again later or use a different protein. Using smaller chunks and quantities help when trying new foods, they may not like everything so can sometimes be trial and error, some prefer minces others prefer chunkier meat. Some like both, experiment and have fun. Chicken, Turkey, Duck, Pheasant, Quail, Pigeon, Partridge, Rabbit , Hare, Beef, Lamb, Venison, Buffalo,Kangeroo, Ostrich, Zebra, Horse , Heart, White fish, Oily Fish, Raw egg. Some use pork although not all dogs tolerate it well. You might also find other stuff like chicken gizzards and pig skin. Liver is rich and not all dogs take to it, same with kidney. Start by giving small bits added in with other food. You can flash fry or use it in liver cakes and find that your dog prefers it this way. Some Dog food companies prepare ready minced raw food that contains the correct ratio of meat, bone and offal. There are facebook groups you can join for raw feeding tips and advice. Is it safe to give my dogs bones? When feeding bones you must never give cooked bones. Cooked bones can splinter and can cause choking and blockages. Always give your dogs raw bones and bones that are suitable for their size. Never give dense bones like that of cows legs for example as this can cause dental problems such as cracked or broken teeth. Always supervise your dog when eating bones. See the video below for further information. We cannot eat raw meat, so how come it is safe to feed my dog raw meat? Dogs and human process their food differently. Dogs have really strong stomach acid and a shorter digestive tract meaning that food is processed quickly and not left too long in the stomach. 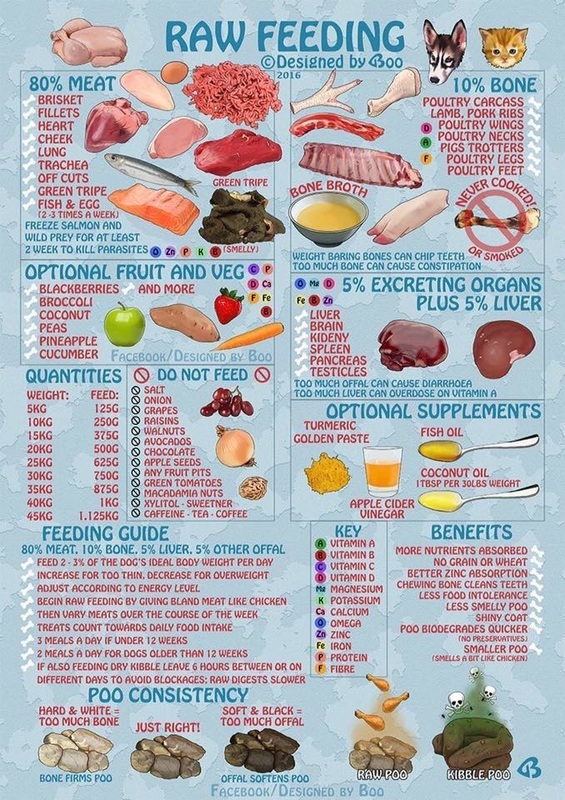 Taken from Vets all natural website : "
The gastric acidity (gastric PH) of the stomach of a dog or cat eating a diet predominantly made up of raw meat is very low (very acidic), with a PH of 2 or lower (relative to the level of meat protein). This highly acidic environment favours the breakdown of raw meats, and raw bones, into soft digestible material. The low PH also is highly effective at killing bacteria, particularly potentially pathogenic bacteria like salmonella spp, clostridia, campylobacter and E Coli. So the natural ‘wild” diet of dogs an cats has evolved a gastric environment that favours the breakdown of raw meats, raw bones, and a PH that kills potentially harmful bacteria – consistent with the requirements of carnivores, and in particular, the scavenging nature of dogs. Also matched to this highly carnivorous diet (raw meat diet) is a very effective digestive process, which occurs in a relatively short gastrointestinal tract. Dogs and cats have a significantly shorter GI tract compared to other non meat eating (herbivorous) animals, whereas man has an intermediate length. The relative length of the gut reflects that nature of the diet, and how efficiently or slowly the food is broken down and absorbed. Fresh raw meat is easily digested and absorbed compared to vegetable matter, and as such, carnivores have a short gut, and rapid gut transit time – fresh meat can be digested and processed in the carnivores body in as little as 8- 12 hrs, whereas plant and vegetable material in a herbivore’s gut can take 3-5 days to be processed." Milly tucks in to a lamb spine.......yummy! I predominantly home cook for my two now as tried most of the premium foods on the market only to find they turned their noses up, maybe a couple of times a week they will have a can of natures menu for convenience but with home cooked I'm guaranteed of an empty bowl in minutes and to be honest I just have a steamer on the hob while I'm doing our evening meal so don't find it a chore anyway. I recommend Lily's kitchen home cooked book too, a great choice of meals and treats in there, a favourite recipe of mine is the meatloaf which I make into individual muffins and freeze these are fantastic for giving for breakfast one or two and my two love them they are also great crumbled up over kibble to tempt them with dry food if you want to. I don't recommend to give too much bread mine occasionally get a little crust because they do like it but that's all it's not great to feed bread to dogs. Scrambled egg great for breakfast with some chopped chicken. As main evening meals I tend to steam all their food so I steam mince different types lamb,beef turkey on the bottom steamer top one has different veg tend to go for the green types like curly Kale, spring greens, brocolli, spinach etc carrots go down well too, to maximise nutrition of the veg chop very small once cooked or blitz in blender as dogs don't digest veg as well as we do but I do believe veg is beneficial to them. I use brown rice,oats, potato & sweet potato as a carb source and I do add supplements like Dorwest Easy Greens great supplement for natural vitamins and antioxidants . I also use light olive oil or coconut oil a teaspoon in dinner is fine. I also feed them fish a couple of times a week mackerel, salmon, tuna, sardines are all excellent use tinned fish in olive oil as better for them and don't use brine too salty, crush the bones in too great source of calcium also keep your egg shells and grind to a powder add a teaspoon to each meal they then have their daily recommended dose of calcium with out the need to have bones if you prefer them not too. Also I steam some liver blitz it in a blender and freeze in small pots and add some to their meals few times a week approx a TBSP too much can give runny poo. Very important: just a quick reminder of no no foods onions, some mushrooms, corn on the cob, tomatoes, green potatoes, garlic in high doses raisins,currants sultanas are all bad for dogs some dangerously toxic. Hope this is of help.